You are here: Home / Uncategorized / What is Paintless Dent Repair? Paintless dent repair is a method of removing dents from vehicle sheet metal using specialized manual tools and carefully applied pressure. Although many people think of PDR as “popping” the dents out, it is really more along the line of carefully massaging the dents back to a flat surface. Dents from tiny dings that are barely visible, up to huge foot-wide cave-ins can be repaired. The main requirement is that there are no sharp ridges in the dent or cracks in the paint. If the vehicle’s paint is still an intact, smooth surface, the dent will likely be able to be pushed back. If the paint is cracked, it will remain cracked. Sharp ridges will also leave a mark on the metal no matter how careful the repair attempt. Most minor dings and hail damage can be successfully repaired with PDR technique. 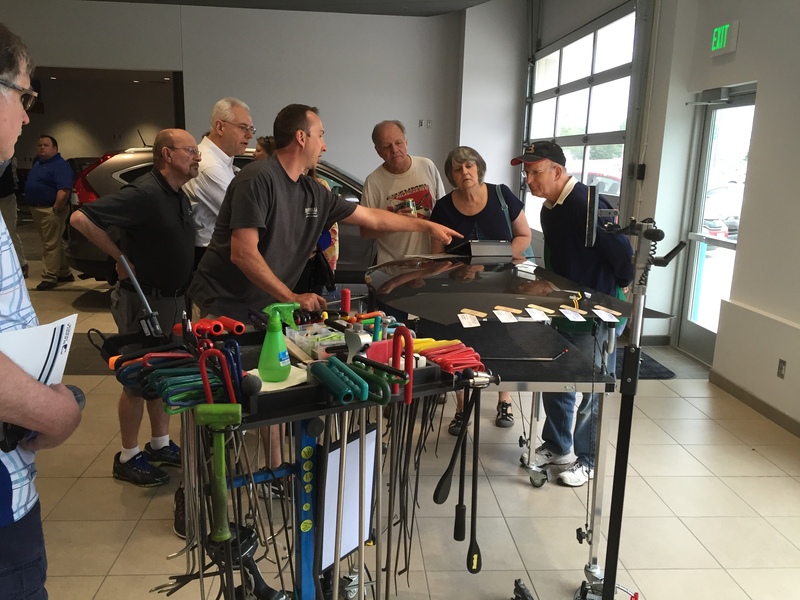 Becoming an expert at paintless dent repair requires years to learn. It’s not just a matter of finding the dents and pushing them out. The technique requires a sharp eye to be able to even spot the dents and gauge them correctly. To avoid damaging the vehicle, it takes skill to carefully remove interior door panels, the vehicle’s interior roof, or anything else required to get at the dent. 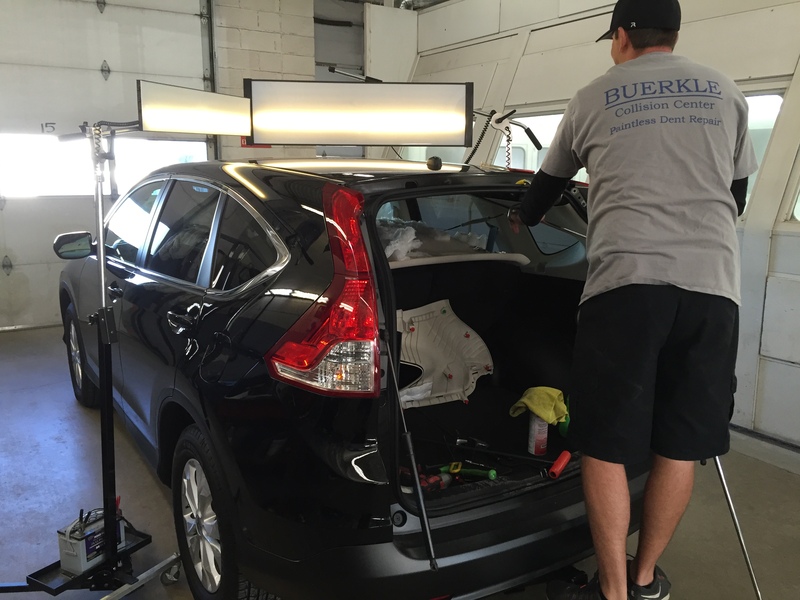 The rear liftgate and vehicle ceiling have been removed on this Honda CR-V to gain access to dents. Once the panels are out and safely stored, the technician needs to locate the dent, which is sometimes at a difficult angle to reach, and select the right tool to use. Often, multiple tools in succession are used on the same dent. Because the dents do not “pop” out, the repair technician needs to carefully push and massage the dent into the correct shape. This can be a flat surface, or curved, depending on where on the vehicle it is located. The technician needs to know what shape he wants to achieve and work to gradually get there. Without paintless dent repair, the only option for most dents is to replace the body panels, which is an even more involved job requiring paint matching on the new panel in addition to removing and replacing the panel. While paintless dent repair is much faster by comparison, an involved job can still easily take several hours to complete. Expect a few hours for most PDR jobs. Contact Buerkle Body Shop to learn more.